Two goals from Benjani heaped more pressure on under-fire Liverpool manager Roy Hodgson as his side were comprehensively beaten at Ewood Park. Blackburn struck first, Martin Olsson coolly driving through Pepe Reina's legs before Benjani smashed a second. 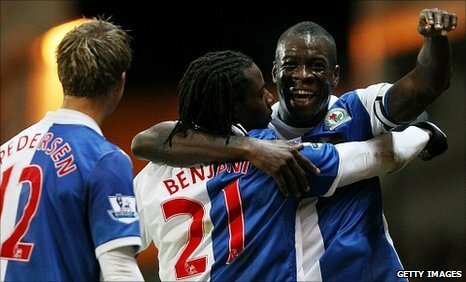 And Rovers drove on against hapless Liverpool, Benjani tapping in a close-range third after David Hoilett's run. Steven Gerrard managed a consolation goal but then blazed a penalty over the bar with six minutes to go. Liverpool's failure to string a run of results together this season has put Hodgson, whose side have only won once on the road, under significant pressure. The Englishman came under heavy fire after losing to Wolves over Christmas but their subsequent 2-1 win over Bolton appeared to have bought him some time. However, this will rank among one of Liverpool's worst setbacks this season, along with the 3-1 loss at Newcastle and 2-0 defeats by Stoke and Everton, and it is difficult to see how he will be able to avoid more negative headlines after a disastrously below-par display that will leave the doom-mongers sharpening their knives. It could have been so different, had Liverpool built on a promising opening five minutes during which Fernando Torres headed wide after a clever one-two with Paul Konchesky. But inconsistency has dogged both these mid-table sides this season, with each starting the game on 25 points, and Liverpool showed their incredibly flaky nature by losing their momentum almost immediately. 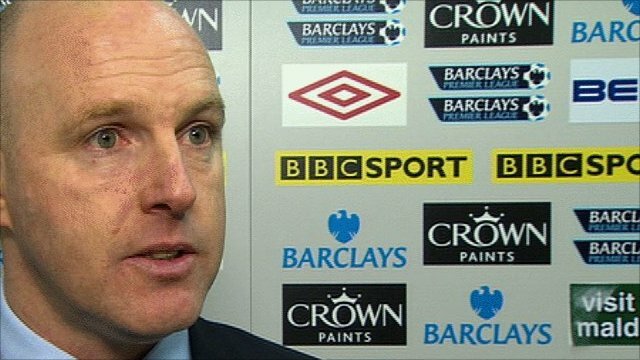 Blackburn boss Steve Kean has also been under pressure after replacing Sam Allardyce, who was fired by Venky's, the club's new owners. However, despite that sacking and a seemingly failed bid for Brazilian star Ronaldinho this week, there is an air of optimism beginning to circle around Ewood Park, with talk of big money being made available by their Indian owners. And the players fed off that, showing constant endeavour and creating a series of chances on the counter-attack. Mame Diouf had the best of these when Olsson's wicked cross flashed beyond Martin Skrtel but it took the striker by surprise and he could only shin the ball into the hands of Pepe Reina. Even with Gerrard, Torres and Joe Cole in the starting line-up, Liverpool attacks were in short supply and Rovers took a deserved lead on the half-hour mark. Ryan Nelsen's long ball found Diouf, who played in the overlapping Olsson and the Swede drove his finish through the legs of Reina. And Blackburn heaped more misery on Liverpool before half-time when Benjani picked up the ball inside the box, spun Sotirios Kyrgiakos expertly and smashed a fierce effort past Reina and into the roof of the net. 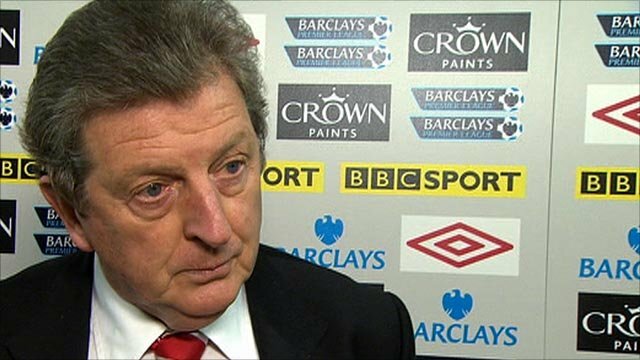 Hodgson looked on crestfallen from the sidelines, with his hands planted in his coat pockets and that was a mood echoed by his players' body language on the pitch. Almost inevitably, Benjani, who had not started since 6 November and scored once in his previous 12 appearances, made it 3-0 on 56 minutes. Hoilett skinned Martin Skrtel as he hit the bye-line and broke into the box before squaring to Benjani, who tapped into the net easily to leave the crowd cruelly singing "you're getting sacked in the morning" in the direction of Hodgson. Liverpool did manage to dominate possession in the second half but that was primarily a product of Blackburn sitting back on their healthy lead and relying on the superb centre-back partnership of Nelsen and Christopher Samba, who Rovers will be desperately keen to keep at Ewood Park. Joe Cole's 25-yard drive was well saved by Mark Bunn as Liverpool finally fired a warning shot. And they did pull one back when Gerrard, playing his 550th game for Liverpool, lashed the ball into the corner from close range. Gerrard was then handed a chance to make the remaining six minutes extremely tense when he was brought down by Michel Salgado in the box. But the Liverpool captain blazed his penalty well over the bar to compound the Reds' agony. 90:00+4:00 The game is over, as the referee blows his whistle. 90:00+2:41 Attacking throw-in by Joe Cole (Liverpool). 90:00+1:43 Header by Fernando Torres (Liverpool) from centre of penalty area (12 yards), missed left. Goal kick taken long by Mark Bunn (Blackburn). 90:00+1:09 Defending throw-in by Paul Konchesky (Liverpool). 90:00+0:34 Foul by Morten Gamst Pedersen (Blackburn) on Fernando Torres (Liverpool). Free kick taken right-footed by Jose Reina (Liverpool) from own half, resulting in open play. 90:00+0:02 Foul by Steven Gerrard (Liverpool) on David Hoilett (Blackburn). Free kick taken right-footed by Michel Salgado (Blackburn) from right wing, passed. 89:11 Goal kick taken long by Mark Bunn (Blackburn). 88:45 Attacking throw-in by Glen Johnson (Liverpool). 88:10 Attacking throw-in by Glen Johnson (Liverpool). 87:06 Defending throw-in by Paul Konchesky (Liverpool). 86:24 Attacking throw-in by Glen Johnson (Liverpool). 86:06 Booking Michel Salgado (Blackburn) booked for unsporting behaviour. 84:39 Goal kick taken long by Mark Bunn (Blackburn). 84:39 Power penalty taken right-footed by Steven Gerrard (Liverpool) (over the bar), missed. 84:39 Foul by Michel Salgado (Blackburn) on Steven Gerrard (Liverpool). 84:02 Goal kick taken long by Jose Reina (Liverpool). 83:12 Foul by Ryan Babel (Liverpool) on Josh Morris (Blackburn). Free kick taken right-footed by Ryan Nelsen (Blackburn) from own half, resulting in open play. 83:12 Substitution Blackburn substitution: Benjani Mwaruwari replaced by Herold Goulon (tactical). 82:26 Defending throw-in by Morten Gamst Pedersen (Blackburn). 81:55 Defending throw-in by Glen Johnson (Liverpool). 80:09 GOAL - Steven Gerrard:Blackburn 3 - 1 Liverpool Goal by Steven Gerrard (Liverpool) right-footed (bottom-left of goal) from right side of penalty area (12 yards).Blackburn 3-1 Liverpool. 78:37 Defending throw-in by Michel Salgado (Blackburn). 78:24 Cross by Ryan Babel (Liverpool), resulting in ball out of play. 77:09 Defending throw-in by Gael Givet (Blackburn). 77:09 Substitution Liverpool substitution: David Ngog replaced by Ryan Babel (tactical). 76:37 Foul by Leiva Lucas (Liverpool) on El-Hadji Diouf (Blackburn). Free kick taken right-footed by Mark Bunn (Blackburn) from own half, resulting in open play. 76:37 Booking Leiva Lucas (Liverpool) booked for unsporting behaviour. 75:29 Attacking throw-in by Glen Johnson (Liverpool). 74:13 Foul by Dirk Kuyt (Liverpool) on El-Hadji Diouf (Blackburn). Free kick taken right-footed by Mark Bunn (Blackburn) from own half, resulting in open play. 74:13 Substitution Blackburn substitution: David Dunn replaced by Josh Morris (tactical). 73:51 Shot by Joe Cole (Liverpool) right-footed from right channel (25 yards), save (caught) by Mark Bunn (Blackburn). 73:32 Goal kick taken short by Jose Reina (Liverpool). Correction - 72:19 Substitution El-Hadji Diouf joins the action as a substitute, replacing Martin Olsson. 72:19 Goal kick taken short by Jose Reina (Liverpool). 72:19 Substitution Blackburn substitution: Martin Olsson replaced by El-Hadji Diouf (tactical). 72:05 Cross by Mame Diouf (Blackburn), resulting in ball out of play. 70:56 Foul by Gael Givet (Blackburn) on Joe Cole (Liverpool). Free kick taken right-footed by Jose Reina (Liverpool) from own half, resulting in open play. 70:35 Shot by David Hoilett (Blackburn) left-footed from right channel (20 yards), missed left. Goal kick taken short by Jose Reina (Liverpool). 69:44 Defending throw-in by Glen Johnson (Liverpool). 69:27 Shot by Steven Gerrard (Liverpool) right-footed from right channel (25 yards), blocked by Morten Gamst Pedersen (Blackburn). 69:13 Shot by Dirk Kuyt (Liverpool) right-footed from left channel (18 yards), blocked by Christopher Samba (Blackburn). 68:33 Mame Diouf (Blackburn) caught offside. Free kick taken right-footed by Jose Reina (Liverpool) from own half, passed. 67:55 Attacking throw-in by Dirk Kuyt (Liverpool). 67:09 Goal kick taken long by Mark Bunn (Blackburn). 66:58 Cross by Joe Cole (Liverpool), clearance by Christopher Samba (Blackburn). 66:28 Attacking throw-in by Paul Konchesky (Liverpool). 65:26 Shot by Fernando Torres (Liverpool) right-footed from right side of penalty area (12 yards), over the bar. Goal kick taken long by Mark Bunn (Blackburn). 64:47 Defending throw-in by Gael Givet (Blackburn). 64:36 Attacking throw-in by Joe Cole (Liverpool). 63:44 Foul by Joe Cole (Liverpool) on David Dunn (Blackburn). Free kick crossed left-footed by Morten Gamst Pedersen (Blackburn) from left wing, save (caught) by Jose Reina (Liverpool). 62:34 Handball by Dirk Kuyt (Liverpool). Free kick taken right-footed by Mark Bunn (Blackburn) from own half, resulting in open play. 62:03 Outswinging corner from left by-line taken right-footed by Leiva Lucas (Liverpool) to far post, resulting in open play. 61:10 Attacking throw-in by Glen Johnson (Liverpool). 60:15 Defending throw-in by Gael Givet (Blackburn). 59:14 Defending throw-in by Glen Johnson (Liverpool). 58:59 Foul by Morten Gamst Pedersen (Blackburn) on Dirk Kuyt (Liverpool). Free kick taken right-footed by Steven Gerrard (Liverpool) from right channel, resulting in open play. 58:15 Defending throw-in by Joe Cole (Liverpool). 58:03 Foul by Fernando Torres (Liverpool) on Ryan Nelsen (Blackburn). Free kick taken left-footed by Ryan Nelsen (Blackburn) from own half, resulting in open play. 57:36 Substitution Liverpool substitution: Rodriguez Maxi replaced by Dirk Kuyt (tactical). 56:22 Assist (pass) by David Hoilett (Blackburn) from left side of penalty area. 56:22 GOAL - Benjani Mwaruwari:Blackburn 3 - 0 Liverpool Goal by Benjani Mwaruwari (Blackburn) right-footed (bottom-left of goal) from left side of six-yard box (6 yards).Blackburn 3-0 Liverpool. 55:26 Joe Cole (Liverpool) caught offside. Free kick taken right-footed by Mark Bunn (Blackburn) from own half, resulting in open play. 54:57 Foul by Benjani Mwaruwari (Blackburn) on Daniel Agger (Liverpool). Free kick taken right-footed by Jose Reina (Liverpool) from own half, passed. 54:35 Attacking throw-in by Michel Salgado (Blackburn). 53:20 Foul by Joe Cole (Liverpool) on Morten Gamst Pedersen (Blackburn). Free kick taken right-footed by Ryan Nelsen (Blackburn) from own half, resulting in open play. 52:50 Attacking throw-in by Michel Salgado (Blackburn). 51:40 Shot by Joe Cole (Liverpool) right-footed from right channel (20 yards), save (caught) by Mark Bunn (Blackburn). 51:09 Defending throw-in by Paul Konchesky (Liverpool). 50:21 Foul by Sotirios Kyrgiakos (Liverpool) on Christopher Samba (Blackburn). Free kick taken right-footed by Mark Bunn (Blackburn) from own half, resulting in open play. 50:21 Substitution Liverpool substitution: Sotirios Kyrgiakos replaced by Daniel Agger (tactical). 49:36 Shot by Steven Gerrard (Liverpool) left-footed from left side of penalty area (12 yards), save (tipped round post) by Mark Bunn (Blackburn). Corner from right by-line taken short right-footed by Steven Gerrard (Liverpool). 49:01 Foul by David Dunn (Blackburn) on Fernando Torres (Liverpool). Free kick taken right-footed by Leiva Lucas (Liverpool) from left channel, passed. 49:01 Booking David Dunn (Blackburn) booked for unsporting behaviour. 48:39 Defending throw-in by Paul Konchesky (Liverpool). 47:22 Attacking throw-in by Paul Konchesky (Liverpool). 46:48 Cross by Morten Gamst Pedersen (Blackburn), save (caught) by Jose Reina (Liverpool). 45:43 Attacking throw-in by Morten Gamst Pedersen (Blackburn). 45:09 Foul by Ryan Nelsen (Blackburn) on Fernando Torres (Liverpool). Free kick taken right-footed by Leiva Lucas (Liverpool) from right channel, resulting in open play. 45:00+1:08 The first half comes to an end. 45:00+0:40 Foul by Leiva Lucas (Liverpool) on Mame Diouf (Blackburn). Free kick taken left-footed by Morten Gamst Pedersen (Blackburn) from right wing, resulting in open play. 44:36 Outswinging corner from right by-line taken right-footed by Steven Gerrard (Liverpool) to centre, shot by Martin Skrtel (Liverpool) right-footed from centre of penalty area (12 yards), over the bar. Goal kick taken long by Mark Bunn (Blackburn). 44:17 Foul by Gael Givet (Blackburn) on David Ngog (Liverpool). Free kick taken right-footed by Steven Gerrard (Liverpool) from right channel, passed. 43:52 Goal kick taken short by Jose Reina (Liverpool). 43:37 Shot by Martin Olsson (Blackburn) left-footed from left channel (25 yards), missed left. 42:43 Defending throw-in by Rodriguez Maxi (Liverpool). 42:29 Defending throw-in by Paul Konchesky (Liverpool). 42:07 Defending throw-in by Paul Konchesky (Liverpool). 41:26 Foul by Steven Gerrard (Liverpool) on David Dunn (Blackburn). Free kick taken right-footed by Ryan Nelsen (Blackburn) from own half, resulting in open play. 41:11 Cross by Fernando Torres (Liverpool), clearance by Christopher Samba (Blackburn). 40:48 Defending throw-in by Paul Konchesky (Liverpool). 39:56 Attacking throw-in by Glen Johnson (Liverpool). 39:27 Defending throw-in by Paul Konchesky (Liverpool). 38:56 Goal kick taken long by Mark Bunn (Blackburn). 38:52 Cross by Steven Gerrard (Liverpool), resulting in ball out of play. 38:27 Corner from left by-line taken short left-footed by Steven Gerrard (Liverpool). 37:25 Assist (pass) by Morten Gamst Pedersen (Blackburn) from left wing. 37:25 GOAL - Benjani Mwaruwari:Blackburn 2 - 0 Liverpool Goal by Benjani Mwaruwari (Blackburn) right-footed (high centre of goal) from centre of penalty area (12 yards).Blackburn 2-0 Liverpool. 36:45 Attacking throw-in by Michel Salgado (Blackburn). 36:26 Header by Fernando Torres (Liverpool) from centre of penalty area (12 yards), save (caught) by Mark Bunn (Blackburn). 35:21 Goal kick taken long by Jose Reina (Liverpool). 34:42 Foul by Fernando Torres (Liverpool) on Ryan Nelsen (Blackburn). Free kick taken right-footed by Mark Bunn (Blackburn) from own half, resulting in open play. 33:59 Foul by Christopher Samba (Blackburn) on Fernando Torres (Liverpool). Free kick taken left-footed by Paul Konchesky (Liverpool) from own half, resulting in open play. 33:02 Goal kick taken long by Mark Bunn (Blackburn). 32:39 Cross by David Hoilett (Blackburn), save (caught) by Jose Reina (Liverpool). 31:05 Assist (pass) by Mame Diouf (Blackburn) from left wing. 31:05 GOAL - Martin Olsson:Blackburn 1 - 0 Liverpool Goal by Martin Olsson (Blackburn) left-footed (bottom-left of goal) from left side of penalty area (12 yards).Blackburn 1-0 Liverpool. 30:09 Shot by Joe Cole (Liverpool) right-footed from centre of penalty area (12 yards), blocked by Christopher Samba (Blackburn). Outswinging corner from right by-line taken right-footed by Steven Gerrard (Liverpool) to far post, resulting in open play. 27:29 Shot by Mame Diouf (Blackburn) right-footed from right side of penalty area (12 yards), over the bar. Goal kick taken long by Jose Reina (Liverpool). 26:51 Shot by Joe Cole (Liverpool) right-footed from right side of penalty area (12 yards), save (tipped round post) by Mark Bunn (Blackburn). Inswinging corner from left by-line taken right-footed by Rodriguez Maxi (Liverpool) to far post, clearance by Christopher Samba (Blackburn). 26:16 Defending throw-in by Michel Salgado (Blackburn). 25:13 Foul by David Dunn (Blackburn) on Steven Gerrard (Liverpool). Free kick taken right-footed by Jose Reina (Liverpool) from own half, resulting in open play. 24:29 Defending throw-in by Michel Salgado (Blackburn). 24:21 Attacking throw-in by Paul Konchesky (Liverpool). 23:56 Foul by Benjani Mwaruwari (Blackburn) on Steven Gerrard (Liverpool). Free kick taken right-footed by Steven Gerrard (Liverpool) from own half, resulting in open play. 23:32 Attacking throw-in by Gael Givet (Blackburn). 22:55 Foul by David Hoilett (Blackburn) on Glen Johnson (Liverpool). Free kick taken right-footed by Jose Reina (Liverpool) from own half, resulting in open play. 22:23 Attacking throw-in by Gael Givet (Blackburn). 21:45 Defending throw-in by Paul Konchesky (Liverpool). 20:41 Foul by David Ngog (Liverpool) on Ryan Nelsen (Blackburn). Free kick taken right-footed by Ryan Nelsen (Blackburn) from own half, resulting in open play. 20:19 Defending throw-in by Gael Givet (Blackburn). 19:30 Goal kick taken long by Mark Bunn (Blackburn). 18:50 Shot by David Dunn (Blackburn) right-footed from right channel (35+ yards), over the bar. Goal kick taken long by Jose Reina (Liverpool). 18:14 Goal kick taken long by Mark Bunn (Blackburn). 18:04 Cross by Glen Johnson (Liverpool), save (punched) by Mark Bunn (Blackburn). 16:37 Shot by Mame Diouf (Blackburn) right-footed from right side of penalty area (6 yards), save (caught) by Jose Reina (Liverpool). 15:57 Attacking throw-in by Morten Gamst Pedersen (Blackburn). 15:24 Attacking throw-in by Gael Givet (Blackburn). 15:14 Goal kick taken long by Jose Reina (Liverpool). 14:45 Shot by David Dunn (Blackburn) right-footed from left channel (20 yards), over the bar. 14:13 Attacking throw-in by Morten Gamst Pedersen (Blackburn). 13:11 Defending throw-in by Michel Salgado (Blackburn). 12:58 Cross by Martin Olsson (Blackburn), clearance by Paul Konchesky (Liverpool). 12:46 Defending throw-in by Mame Diouf (Blackburn). 12:16 Goal kick taken short by Jose Reina (Liverpool). 11:22 Foul by Martin Skrtel (Liverpool) on Benjani Mwaruwari (Blackburn). Free kick crossed right-footed by Morten Gamst Pedersen (Blackburn) from right wing, resulting in ball out of play. 10:54 Mame Diouf (Blackburn) caught offside. Free kick taken right-footed by Sotirios Kyrgiakos (Liverpool) from own half, resulting in open play. 10:27 Header by Martin Olsson (Blackburn) from right channel (18 yards), save (caught) by Jose Reina (Liverpool). 9:54 Attacking throw-in by Morten Gamst Pedersen (Blackburn). 9:15 Defending throw-in by Paul Konchesky (Liverpool). 8:20 Attacking throw-in by Morten Gamst Pedersen (Blackburn). 7:37 Attacking throw-in by Glen Johnson (Liverpool). 7:08 Outswinging corner from right by-line taken right-footed by Steven Gerrard (Liverpool) to near post, clearance by Ryan Nelsen (Blackburn). 6:26 Foul by Martin Olsson (Blackburn) on Glen Johnson (Liverpool). Free kick taken right-footed by Jose Reina (Liverpool) from own half, resulting in open play. 5:58 Foul by David Dunn (Blackburn) on Rodriguez Maxi (Liverpool). Free kick taken left-footed by Leiva Lucas (Liverpool) from own half, passed. 5:26 Header by Fernando Torres (Liverpool) from centre of penalty area (12 yards), missed right. Goal kick taken long by Mark Bunn (Blackburn). 4:58 Defending throw-in by Gael Givet (Blackburn). 3:44 Fernando Torres (Liverpool) caught offside. Free kick taken right-footed by Mark Bunn (Blackburn) from own half, resulting in open play. 2:50 Goal kick taken long by Jose Reina (Liverpool). 2:13 Attacking throw-in by Morten Gamst Pedersen (Blackburn). 2:01 Defending throw-in by Glen Johnson (Liverpool). 0:24 Defending throw-in by Paul Konchesky (Liverpool).